WASHINGTON, D.C. -- U.S. workers continue to be more likely to say their get a sense of identity from their job, 55%, as opposed to having their job just be something they do for a living, 42%. These results have been consistent throughout multiple Gallup polls since 1989. 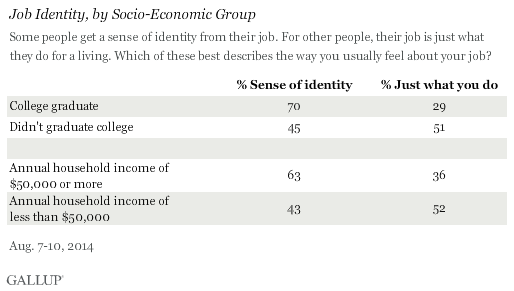 As part of Gallup's annual Work and Education poll, employed Americans were asked if they get a sense of identity from their job. Gallup asked this question on an occasional basis from 1990 through 2003, and then again this year. Although there was a downtick in the percentage who said they get a sense of identity from their work in 1999, the results over time have been generally stable, and the 2003 results are almost identical to those this year. Education is one of the most significant predictors of how workers approach their job, with 70% of college graduates saying they get a sense of identity from their job, compared with the 45% of Americans who don't hold a college degree who say the same. American workers in households with higher annual incomes are also more likely to receive a sense of identity from their job. Sixty-three percent of those whose annual household income is $50,000 a year or more get a sense of identity from their job, compared with 43% of Americans who live in households with lower annual incomes. However, as this question measures household rather than individual income, the results do not necessarily mean that Americans with higher paychecks get a sense of identity from their job, particularly because those in upper-income households predominantly have two working adults in the household and those in lower-income households have only one. Older working Americans, those aged 45 and older, are slightly more likely than younger workers to get a sense of identity from their job. This difference may be generational, reflecting older workers coming of age during a time when occupation mattered more to employees than it does today. Or it may be that older Americans have been in the workforce longer and may be more established in their careers, thus gaining more of their identity from their job. Women are slightly more likely to get a sense of identity from their job than men. However, in past polling, these differences were less pronounced. 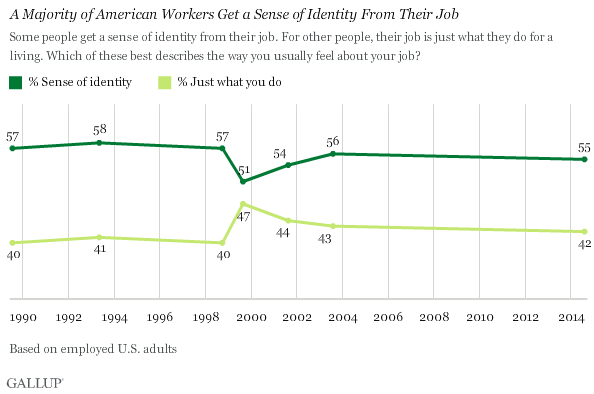 More American workers get a sense of identity from their job as opposed to saying it is just what they do for a living. Americans who graduated college are the most likely group to get a sense of identity from their job, perhaps because advanced education opens up more job opportunities for them than someone without a college degree, meaning they could find a better fit between their interests and the type of work they do. Results for this Gallup poll are based on telephone interviews conducted Aug. 7-14, 2014, with a random sample of 1,032 adults, aged 18 and older, living in all 50 U.S. states and the District of Columbia.